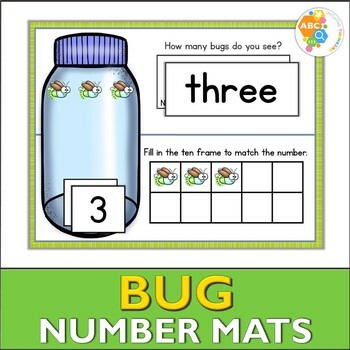 Bug Number Mats 1-10 provide a hands-on approach in helping children learn to count, recognize numbers, and cardinality. ❶Count the amount of bugs in the jar on each mat. ❷Find the correct number and number word card to match that amount. 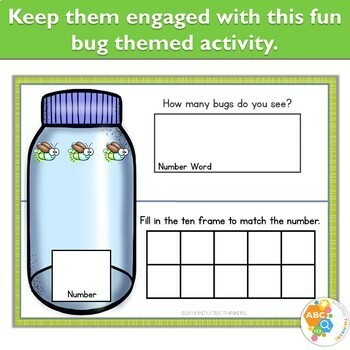 ❸Represent that amount in the tens frame with the bug pictures or playdough balls. This resource is a perfect way to review to numbers in a math center, small group, 1-on-1 or independent setting! This would be a great addition to your preschool, pre-k, kindergarten, or special education class. Parents, this would also be a fun activity to incorporate in your tot schooling or homeschooling curriculum. Activity mats are easy to prep and can be used year after year! You will need to print on cardstock and/or laminate all pages for longer durability. This resource was designed to be used as activity mats; however, you can place them in sheet covers and use them in a 3 ring binder. ❶Print on cardstock and/or laminate for durability. ❷Cut apart number cards, number words and gumball pictures. Optional: Velcro can be attached to the empty boxes on the mats and on the back of the number and picture cards. ✔K.CC.A Know number names and the count sequence. ✔K.CC.A.1 Count to 100 by ones and by tens. ✔K.CC.B Count to tell the number of objects. 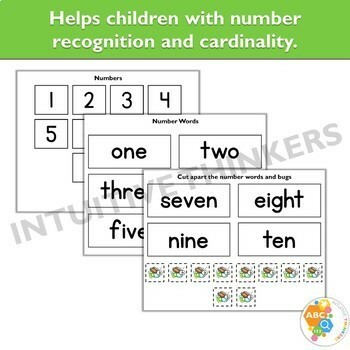 ✔K.CC.B.4 Understand the relationship between numbers and quantities; connect counting to cardinality. ✔K.CC.B.4a When counting objects, say the number names in the standard order, pairing each object with one and only one number name and each number name with one and only one object. ✔K.CC.B.4b Understand that the last number name said tells the number of objects counted. The number of objects is the same regardless of their arrangement or the order in which they were counted. ✔K.CC.B.4c Understand that each successive number name refers to a quantity that is one larger. ✔K.CC.B.5 Count to answer "how many?" questions about as many as 20 things arranged in a line, a rectangular array, or a circle, or as many as 10 things in a scattered configuration; given a number from 1-20, count out that many objects. ►Be sure you have the latest version of Adobe Acrobat to open this file. Get it completely free here. ►Click the ⭐ to follow my store. You will be notified when new products are added and when my store goes on sale. ►If you enjoyed this product, don't forget to leave your positive feedback. By doing so you can earn TpT credits to use on future purchases. Find out more here. ►If you have any questions or concerns about the product, please contact me through the Product Q & A section below and I'll get back to you as soon as possible!